How does the WooHoo integration work? A quick walkthrough on how the WooHoo - Recart integration works. Who said pop-ups can’t be fun? Add some playful spirit to your pop-ups, and watch as the gamified process boosts Messenger subscriptions and sales. 1. Install both WooHoo and Recart on your Shopify store. 2. Enter the Recart app (Shopify Admin – Apps – Recart), go to your Messenger menu and connect a Facebook page you’d love to use for message sending. Go to your Settings, and then make sure to enable Collect Messenger leads. This will replace the email subscription form on your popup with the Messenger checkbox. 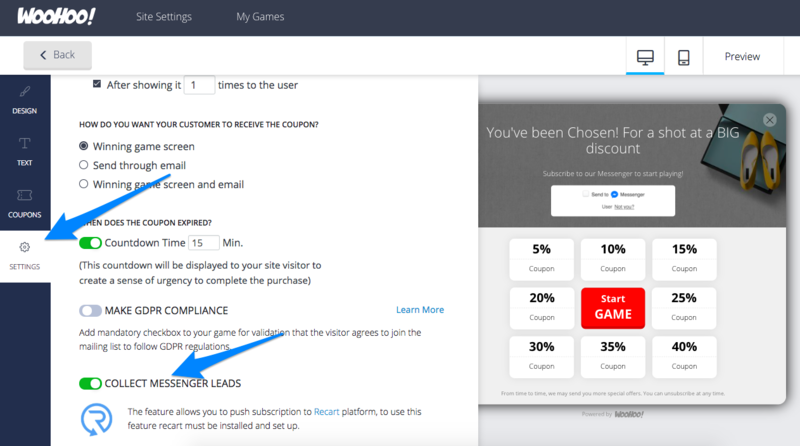 Your visitors now can play the game without having to manually type in their email address. Checking out your WooHoo popup on your store, you should see the Messenger widget in your gamified popup. From now on, everyone who plays your games will also subscribe to your Recart Messenger list. +1: Of course, you'll need to fine tune your popup as well. Test out what works best for you. You'll need to decide what game to choose, when to display the feature, and what kind of rewards you want to offer.